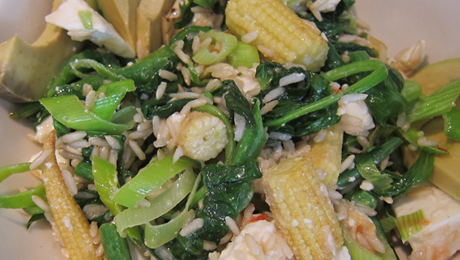 A quick and easy rice salad, it's rather tasty too, enjoy! Heat a pan over a medium heat and toast the mustard seeds for 30 seconds until just fragrant. Add the olive oil, green beans and leeks, and season with some salt. Continue cooking for 1 -2 minutes until tender. Add the spinach and a big squeeze of lemon juice to the pan. Cook until slightly wilted. Remove the pan from the heat and toss in the brown rice, feta cheese, Chilli Jam and a further squeeze of lemon juice and zest. Taste and adjust seasonings. Before serving, add the avocado slices and a few more mint sprigs.